A wide range of premium quality labelstock for the food and beverage industry from Lecta's Adestor range. Continuing with the theme from the first edition, the new Labels to Celebrate swatch book pays tribute to celebration-worthy moments. This collection of premium pressure-sensitive labelstock is designed for labeling wine, sparkling wine, spirits and beer, as well as luxury food products. The diverse selection of papers and films used as facestock come in a variety of textures, finishes and colors. Combined with Lecta’s water-based acrylic adhesives, they are designed to meet the needs of the most demanding food and beverage end uses and applications. Adestor ​products are suitable for UV flexo, UV offset and a variety of digital printing processes. The new swatch book features an array of eye-catching designs for different types of labels and packaging: red, white and rosé wines, beer, spirits, sparkling wine and gourmet food products. Twenty-seven labels have been created employing a wide range of printing techniques such as silkscreen, stamping and embossing. The result is a unique collection to showcase the different possibilities that the Labels to Celebrate range offers label printers and manufacturers. All Adestor products are manufactured under ISO 14001 and EMAS environmental standards and ISO 50001 energy efficiency, ISO 9001 quality and OHSAS 18001 occupational health and safety standards. They are also available with PEFC™ and FSC® Chain-of-Custody forest certification upon request. 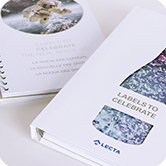 For further information on the Labels to Celebrate range please visit our Products ​section, where you can find complete technical specifications and full details on Lecta's self-adhesive product line.